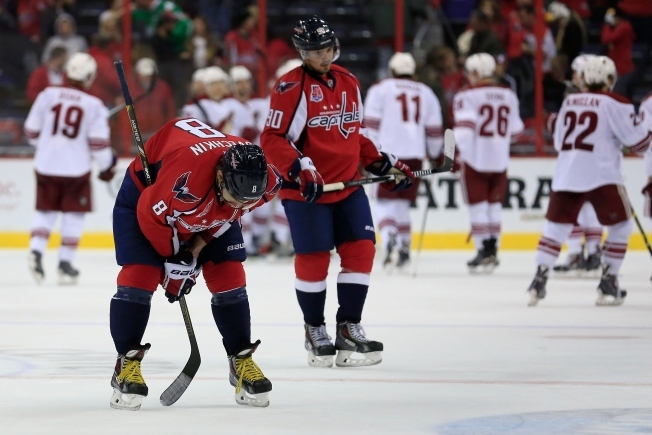 The double doors to the Washington Capitals' locker room remained closed 10 minutes after their loss to the Arizona Coyotes on Sunday, their fourth straight and fifth in six games. "A few more minutes, guys. Thanks for your patience," a team spokesman told the assembled media, a sentiment that surely couldn't be shared within the dressing room. Inside, the Capitals piled up their troubles during a players-only summit, the nightmarish residue of reemerging problems staining the freshly installed carpet. The doors opened at roughly 10 p.m., leading into an eerily silent locker room, the unraveling of tape and exasperated sighs providing the only soundtrack. "Little grim," forward Troy Brouwer said, describing the mood. "Little grim." As they struggled over the past week-plus, the Capitals were steadfast in their assertion that their record was not indicative of their overall effort. To their credit, they weren't completely wrong. They weren't being dominated by any stretch. But every imaginable mistake that they were making -- and there were a lot of them -- was being taken advantage of. A 3-1 lead entering the second period, padded by Alex Ovechkin's first goal in six games, seemed safe against the hapless Coyotes, a road-weary team that was the worst the Western Conference had to offer. The two-goal lead evaporated by period's end, a painful reminder of the 13 two-goal leads that the Capitals squandered last season. Two turnovers within 90 seconds of each other in the defensive zone, a 75-by-85-foot house of horrors for Washington a year ago, led to goals against early in the third period that sealed yet another avoidable loss. "We need to be better, period," defenseman Mike Green said. "We let a game slip away, 3-1 lead and here we are, we lost a game. That's unacceptable. Us as guys in this dressing room need to figure it out." If they don't, coach Barry Trotz will. In the 1,196 games that Trotz had coached in his first 15 years in the NHL, surely he had seen everything. He preached patience to his players, maintaining that adversity would test them. The inevitable upsurge of frustration, try as he might to stem it, was too much for even Trotz to handle. "It’s an old story already," he said. "It’s too old for me. "That behavior has to change or we have to change people, it’s plain and simple. Ice time, look at different people in different situations. To me it’s absolutely unacceptable. They have to fix their behavior. It’s my job to fix the behavior. I don’t like the behavior. If they’re not going to fix it internally, individually, then I’ll make sure I fix it." Trotz spoke of an uneasy feeling that he had recently been having about his team. It felt like "we want to play as hard as we just need to," which significantly clashed with his industrious ideals. It's a reputation that dogged the Capitals long before Trotz arrived and one that they will now have to work even harder to shed. "We need to work," Brouwer said. "We need to work harder. We need to work smarter. We’re a good team in here, but we have to prove it. We have to show it."